One of the most common cash control procedures is the bank reconciliation. In business, every bank statement should be promptly reconciled by a person not otherwise involved in the cash receipts and disbursements functions. The reconciliation is needed to identify errors, irregularities, and adjustments for the Cash account. Having an independent person prepare the reconciliation helps establish separation of duties and deters fraud by requiring collusion for unauthorized actions. Differences are caused by items reflected on company records but not yet recorded by the bank. Examples include deposits in transit (a receipt entered on company records but not processed by the bank) and outstanding checks (checks written which have not cleared the bank). Other differences relate to items noted on the bank statement but not recorded by the company. Examples include non-sufficient funds (NSF) checks (“hot” checks previously deposited but which have been returned for nonpayment), bank service charges, notes receivable (like an account receivable, but more “formalized”) collected by the bank on behalf of a company, and interest earnings. The following format is typical of one used in the reconciliation process. Note that the balance per the bank statement is reconciled to the “correct” amount of cash; likewise, the balance per company records is reconciled to the “correct” amount. These amounts must agree. Once the correct adjusted cash balance is satisfactorily calculated, journal entries must be prepared for all items identified in the reconciliation of the ending balance per company records to the correct cash balance. These entries serve to record the transactions and events which impact cash but have not been previously journalized (e.g., NSF checks, bank service charges, interest income, and so on). The following pages include a detailed illustration of the bank reconciliation process. Begin by carefully reviewing the bank statement for The Tackle Shop found below. Then look at the company’s check register spreadsheet that follows. Information found on that spreadsheet would correlate precisely to activity in the company’s Cash account within the general ledger. Check #5454 was written in June but did not clear the bank until July 2. There were no other outstanding checks, and no deposits in transit at the end of June. The EFT (electronic funds transfer) on July 11 relates to the monthly utility bill; the Tackle Shop has authorized the utility to draft its account directly each month. The Tackle Shop is optimistic that they will recover the full amount, including the service charge, on the NSF check that was given to them during the month. The bank collected a $5,000 note for The Tackle Shop, plus 9% interest ($5,450). The Tackle Shop’s credit card clearing company remitted funds on July 25; the Tackle Shop received an email notification of this posting and simultaneously journalized this cash receipt in the accounting records. The Tackle Shop made the deposit of $3,565.93 late in the day on July 31, 20X3. The ending cash balance, per the company general ledger, was $47,535.30. Be aware that conducting a successful bank reconciliation requires careful attention to every detail. After examining the bank statement, check register, and additional information, proceed to verify each component within (1) the balance per bank statement to the correct cash balance and (2) the balance per company records to the correct cash balance. 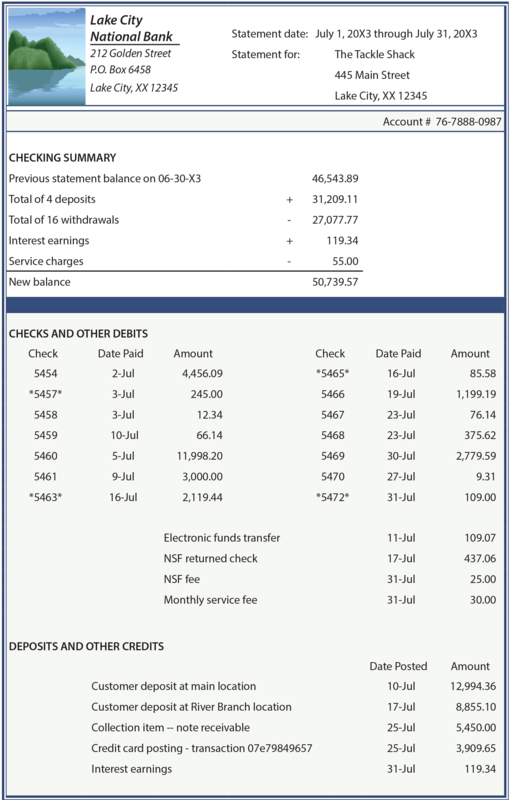 Below is the July reconciliation of the balance per bank statement to the correct cash balance. The reconciliation of the balance per company records to the correct cash balance is presented below. This reconciliation will trigger various adjustments to the Cash account in the company ledger. The identified items necessitated increasing cash by $4,968.21 ($52,503.51 correct balance, less the balance per company records of $47,535.30). Note that the $462.06 debit to Accounts Receivable indicates that The Tackle Shop is going to attempt to collect on the NSF check and related charge. The interest income of $569.34 reflects that posted by the bank ($119.34) plus the $450 on the collected note. This reconciliation example demonstrates the importance of the process, without which accounting records would soon become unreliable. Another example of an item that could impact the bank statement but not yet be recorded on company records relates to the use of bank “debit cards.” A bank debit card transaction is equivalent to an electronically generated check but it results in an almost immediate withdrawal of funds. Such withdrawals would be listed on the bank statement individually. Great care is necessary to record each debit card transaction into the accounting records, and appropriate approval and documentation can be problematic. When debit cards are used, the reconciliation process is often complicated because additional withdrawals will be discovered on the bank statement that still need to be recorded on the company records. Many businesses prepare a reconciliation just like that illustrated. However, this approach leaves one gaping hole in the control process. What if the bank statement included a $5,000 check to an employee near the beginning of the month, and a $5,000 deposit by that employee near the end of the month (and these amounts were not recorded on the company records)? In other words, the employee took out an unauthorized “loan” for a while. The reconciliation would not reveal this unauthorized activity because the ending balances are correct and in agreement. To overcome this deficiency, some companies will reconcile not only the beginning and ending balances, but also the total checks per the bank statement to the total disbursements per the company records, and the total deposits per the bank statement to the total receipts on the company accounts. If a problem exists, the totals on the bank statement will exceed the totals per the company records for both receipts and disbursements. This added reconciliation technique is termed a proof of cash. It is highly recommended where the volume of transactions and amount of money involved is very large. Also illegal is “kiting” which occurs when one opens numerous bank accounts at various locations and then proceeds to write checks on one account and deposit them to another. In turn, checks are written on that account, and deposited to yet another bank. And, over and over and over. Each of the bank accounts may appear to have money; but, it is illusionary, because there are numerous checks “floating” about that will hit and reduce the accounts. Somewhere in the process the perpetrator makes a cash withdrawal and then vanishes. That is why one will often see bank notices that deposited funds cannot be withdrawn for several days. Such restrictions are intended to make sure that a deposit clears the bank on which it is drawn before releasing those funds. Kiting is complex and illegal. Enhanced electronic clearing procedures adopted by banks have made kiting far more difficult to accomplish. Why are bank reconciliations necessary? What items are likely to be included on the company records, but not the bank records? 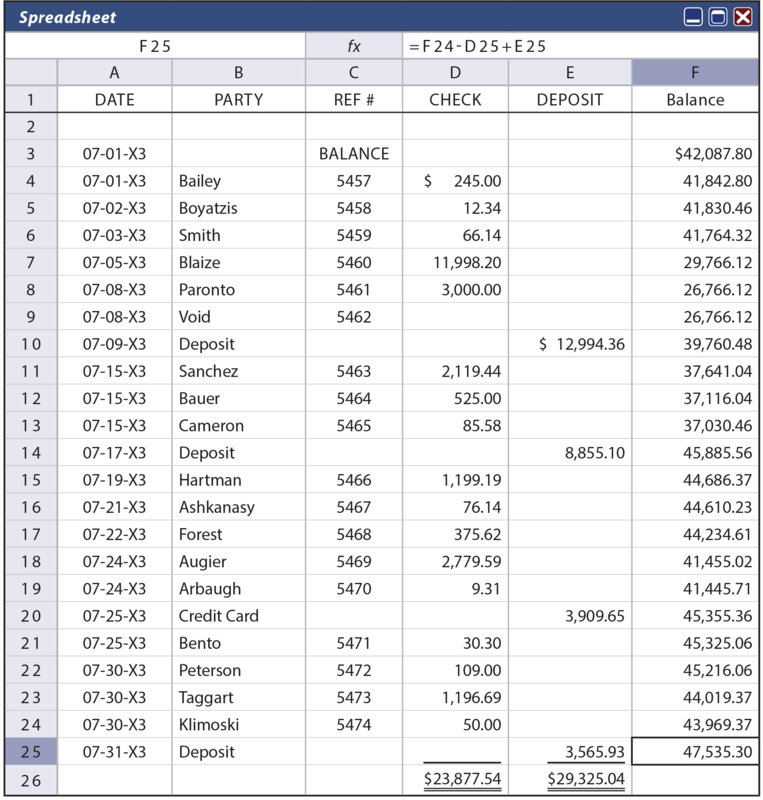 Be able to create and solve a complex problem requiring a bank reconciliation. Which items on a bank reconciliation require an adjusting journal entry, and why? What is a proof of cash?